Facebook is doubling down on 360-degree videos.The social network is expanding support for the immersive News Feed videos in a big way, the company announced Thursday. 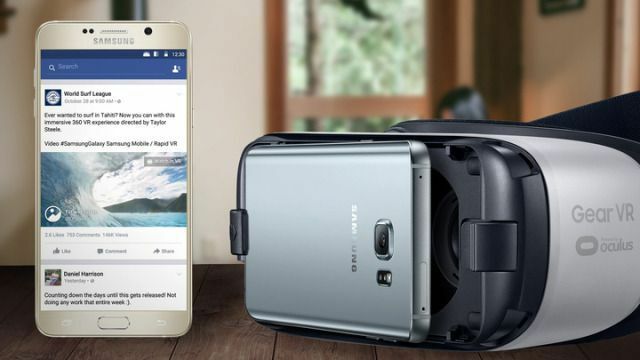 Facebook is adding support for iOS and Gear VR headsets (but not Google Cardboard) and some consumer 360-degree cameras. It’s also opening the format to brands who want to experiment with the videos. Unlike regular videos, 360-degree clips require specialized cameras that are able to capture a full view of the scene around them. You can change your view of the videos by holding your smartphone at a different angle or by dragging your finger (or cursor, if you’re in a browser) around the frame. Facebook first added support for these videos in September, but until now the videos were only available from Facebook’s website and Android app. Though 360-degree videos aren’t technically the same as virtual reality, viewing them through a a virtual reality headset offers a much more immersive experience and could be seen a first step toward a bigger virtual reality push from Facebook. The company is also partnering with consumer camera manufacturers to make it easier for people to upload their own 360 videos. Those with cameras from Ricoh Theta, Giroptic, and IC Real Tech will have the ability to publish videos to Facebook directly from the camera’s app. Additionally, Facebook is launching a dedicated site for people who want to start tinkering with the videos. The site will offer tips, FAQs and other guidelines from Vrse, a virtual reality studio. Advertisers are also beginning to experiment with the format and users will begin to see 360 video ads from AT&T, Corona, Nescafe, Samsung, Disney and others.